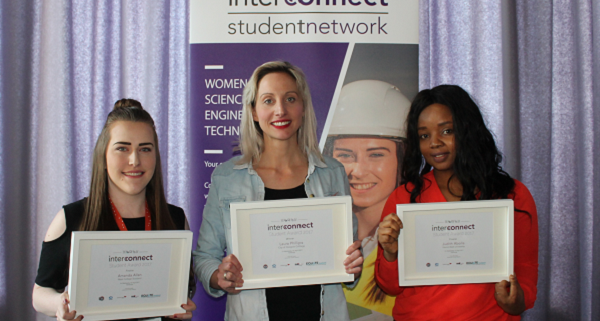 Our second Interconnect Student Award goes to Laura Phillips from City of Glasgow College, an engineering student who has gone above and beyond to support and promote her women peers. Amanda Allan of West College Scotland and Judith Abolle of Heriot-Watt University were also shortlisted for the award. The award was presented at our Interconnect Student Conference on 12th April 2017, hosted by the University of Edinburgh. The conference brought women STEM students from colleges and universities across Scotland together to explore career possibilities and celebrate their passion for STEM. The morning included speakers, activities and networking opportunities for women students and STEM employers. Dr. Susie Mitchell was the keynote speaker and spoke about her own experiences of studying science, her PhD in Cancer Research and a wide variety of roles in science and equalities. Susie is a fantastic role model for women in science and gave students some great advice about making the most of opportunities.